A slow start ultimately proved costly as the Bedford Blues Academy slumped to a 25-17 defeat against the Loughborough University U21s. The Loughborough students scored three first half tries to lead 15-0 at half-time, and an improved second half performance from Bedford couldn’t prevent them from slipping to the loss. 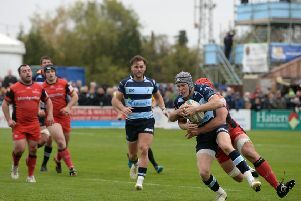 The first 20 minutes saw a succession of errors from both sides, with poor discipline from the Blues gifting Loughborough a string of penalties and field position. Loughborough scored their first try after 25 minutes when full-back Jack Stapley –who was with the Blues Academy last season – scored on the blind side. Loughborough scored two further tries in the next 10 minutes to lead 15-0 at the interval, and the students enjoyed an excellent start to the second half. From a scrum in the Blues half, a No 8 pick-up led to a ruck, before quick ball and an overlap on the left hand side created a well worked try from another Blues Academy old boy, winger Will Foster. Bedford began to settle and, from a 5m lineout a few minutes, later prop Charlie Robinson was driven over, to make the score 20-5. The students hit back when a Blues clearance kick missed touch; Loughborough counter-attacked and Foster scored again to increase the lead to 25-5. Bedford scored two further tries from fly-half Ben Phillips, and full-back Liam Shields, with a conversion by the latter meaning the game finished 25-17 to the students. Blues academy director Denis Ormesher said: “We were again poor in the first half. We were slow to get going, and never established a forward platform against the older students’ side. The Blues Academy are away on Saturday against the Cambridge University LX Club, the University’s 2nd XV, at Grange Road, k/o 2pm. Bedford: Charlie Robinson (c), Aubrey Grimes, Henry Peck, Sam Copeland, Charlie Harvey, Jacob Moody, Rahat Choudray, Callum Strachan; Olly Howard, Harry Hutchins; Ross Taylor, Jose Fernandes, Jack Gibbs, Ryan Hutler; Max Titchener. Replacements: Michael Bond, Leon Patel-Champion, Ben Thompson, Kyron Houston, Tim Herbert, JonJo Fanning, Dylan Leney, Ben Phillips, Olly Venni, Liam Shields.